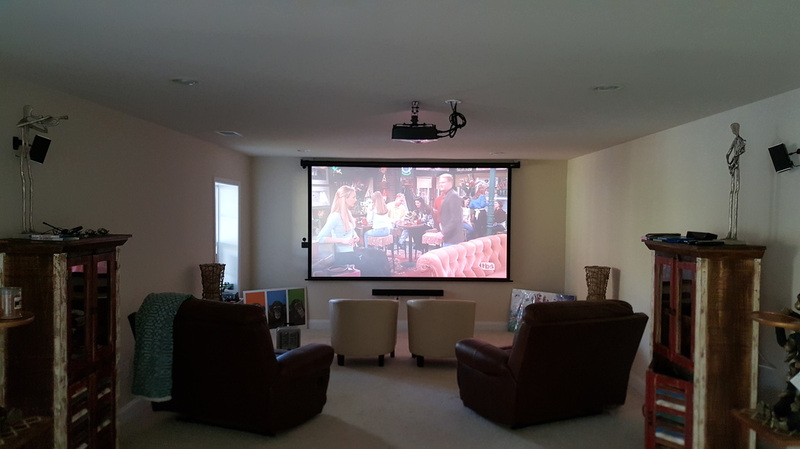 ​As you can see he hired us again to design and install their Home Theater! "It is only a handful of times you run into someone (or a company) that you are so impressed with. Rob is one of those rare people. He is extremely knowledgeable, passionate, dedicated and courteous. He came to install a home theater system at my place and I'm so glad I got in touch with him thru thumbtack. Though the job took longer for him than expected due to problems in my wall (crazy builder/settlement), he still respected the original estimate he gave me. It is just amazing to see someone willing to work all those extra hours in a day to get the job done in the specified time. He explained what/how he is going to do the job, had great suggestions, set it up, tested everything at the end and we are very happy with the outcome. He also wall mounted my TV. 5 stars for everything he did at my house. He has well-rounded experience in several home related areas that you can benefit from. He is the definition of being professional and I would happily recommend him to anybody else." "I was extremely impressed with the way Rob assisted and my family with the deployment of TV mount. Rob patiently provided consultation of the mounting options that were available to me. From my first encounter with him via the telephone till the time he showed up at my house at such a short notice, Rob took his time to explain the reasons and steps he took to build the mount. My wife and I enjoyed his method of providing the theory as shows the practical. I would recommend Rob and his company to anyone else as I believe they will provide the same level of excellence and professionalism as I received." 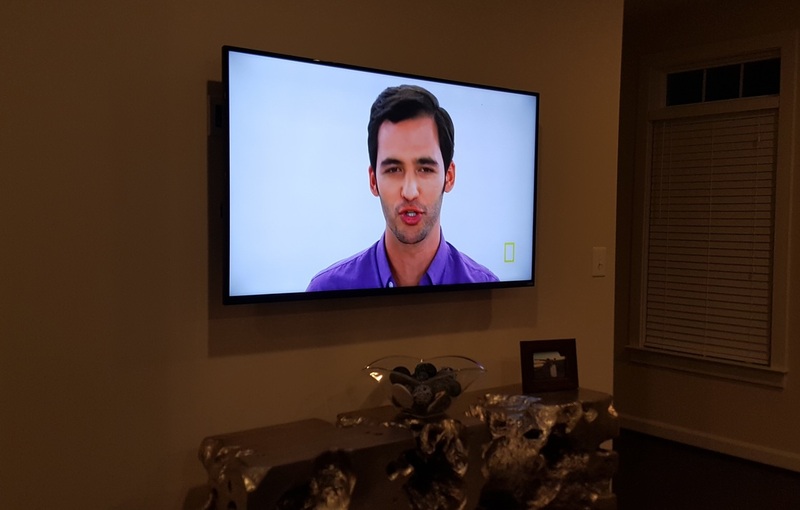 "I hired Trebor Technical Solutions to mount a TV above my fireplace. When Rob arrived, he was very professional and courteous. He went through every step of the process to ensure I was aware and in agreement of the work being performed. Rob did an excellent job mounting the TV and concealing the wires. Prior to leaving, Rob ensured I was completely satisfied with the outcome of the project. I would definitely hire Trebor Technical Solutions on future projects and highly recommend him to my family and friends." "Ron provided great service and did an excellent job mounting my 40 inch TV. He made recommendations and provided the pros and cons of each. He was very knowledgeable, professional and the cost was reasonable for the time and work that was done. I am very happy with the end result and highly recommend this company." "Trebor Technical Solutions, LLC came over my house on December 23, to install a security cameras system, . Mr Rob was very professional with the job hi did at my house. I will always call him back ,, and I alway recommend Trebor Technical Solution, LLC to all my friends and family. Great job. ."
Terrible communications, then blames the customer. "I was hoping for the ability to do a zero star rating. As others have mentioned here, extremely poor communication then blames the customer. First, he made up that he called me for my address. Hint: Cell phone call logs have improved these days. Asked me to confirm online the apt, I report back that it was done. Someone responded back 'thank you for confirming'. My responses to them were literally within minutes every time including me sending him photographs of the required project. After no show, he said my response confirming the appt was done, meant the job was done and I didn't need him. Ridiculous! Then, he calls me getting loud and defensive on the phone with me. I was shocked how condescending he was, too. Honestly, it was the most uncomfortable phone call over Rob's miscommunication error that I've ever seen. I don't want to see their business get hurt, but people should be aware of his abrasiveness more than miscommunication over a scheduled time. His attitude made me very skeptical and I'm not letting him near any of my projects. Terrible experience!!!!" I am disheartened at Christopher's frustration about getting his project completed. The simple truth is that we wanted to do his job. After we sent several messages via Thumbtack and text requesting his address to confirm his appointment, we still had no address. Christoper is right about one thing, we should have also called (which I thought we had, but after checking the log, we had not). As a resolution, I offered to come out this evening (Friday) 7:00 p.m. to his job. He declined. Our recent "verified" reviews serve as a testament to the fact that I really take this business seriously. We try to combine the technical aspect with a great customer experience to deliver a product and service second to none. Point blank, we failed at doing this with Christopher. We will take this "learning opportunity" and use it to do better in the future. It is our goal. Christopher, once again, I apoligize that you had a terrible experience. "Rob did a great job. He spent a great deal of time and energy to ensure we were satisfied." "Professional precise excellent customer service will recommend him two friends and family"
"Rob arrived on time, with all the right equipment, and was extremely professional. His attention to detail and desire to get the job done right is exactly what you're looking for when you hire a contractor but often rarely get it. I highly recommend TTS for your home theater installation!" "Ron of Trebor Technical Solutions arrived with a pleasant and soothing attitude. He explained the process of mounting my TV step by step. Upon completion, he cleaned up the area and even helped me move the old large heavy TV to the garage to allow it to be picked up by a donation program." and the end product looks amazing on the wall. The fact that I did not have to do any shopping for mounts was a great time saver for me. I Will definitely do more business with this company!!" "Rob did an excellent job mounting my 65 inch tv and console. Super friendly and professional, and most importantly great at what he does. He even ended up staying late just to make sure everything was just right. I'd recommend him to anyone in the area looking for mounting services. The work was well worth the money and my living room looks great now thanks to him!" "Rob did an outstanding job mounting my new 60 inch tv! His service is second to none. He had the patience to do the job correctly and made sure everything was perfect before leaving. Rob mounted a new tv and sound bar into an old brick wall of a row home in Canton. I would use Rob again and recommend him to anyone looking for help to improve their home entertainment/theater systems. Thanks so much Rob!" "Rob responded to my request in a very timely manner, and did expert work for our office telephone needs! After a thorough assessment, Rob properly diagnosed our needs and completed the work efficiently and diligently. We now have a well-functioning system that meets our staff needs. Thanks!" "Great company and great quality work. Will use again!" "We required a phone line be installed in a home office. In addition, contractor suggested running ethernet at the same time. He didn't have proper parts the first time he came out. No charge for that visit. He returned and installed all lines." "Great response rate and quality work. Couldn't be happier. Thanks!" Great service from a great professional. "Rob came by and did the install himself. Awesome service and real personable guy. Thoroughly enjoyed his work and will be hiring again. :)"
"Our service was terrific. We will be using this company for other projects and referring them to everyone. Very personable, excellent work, and the price was worth every dime. I recommend if you want great service use Trebor technical Solutions. Thanks Mr. Rob." "Everything was very professional from the beginning to end , he installed a 46" tv in my bedroom, I will definitely use him to mount my 65" over my fireplace and another 42 in another bedroom very pleased with quality of work"
"Almost 10 hours of work later, everything looks great and works as expected." "An hour and a half late. Tired of waiting." Todd is right. As a business in the service industry, we failed to communicate "a 1 hour service window"; hence, when we texted our announcement that we would arrive between 10 a.m. and 11 a.m., he did respond that he expected me at 10 a.m. Subsequent communication between us and an honest effort to drive 45 minutes to meet him was unsuccessful. For this, I apologize. "Rob was excellent. A wonderful experience from a highly skilled, extremely professional and absolutely committed business owner who does everything to make your installation perfect! Highly recommend Trebor Technical Solutions (Rob) and we look forward to doing our future projects with him. This is how service used to be and it was wonderful to see it is still alive and well with Rob! Thank you!" John. It was a pleasure to be of service. Your hospitality made even more pressing to me that we meet your expectations - and I'm glad we did. Thank you very much for your business. . Thanks Clyde. Even with a few complications, we were able to find the solutions, and meet your expectations. It what we strive to do with every customer. Thank you very much for your business. Thanks Margaret. Its our pleasure to be of service. Thanks very much for your business. "Great company....great work by Rob....a true professional who put in a long day and whose patience is limitless. Highly recommend anyone wanting to upgrade their TV units and their music system to give Rob a call. "Rob was extremely thoughtful, professional, and even took my calls up to 11pm (not sure he would want me to say this!). I would absolutely use him again. Very happy." "Excellent service! Very responsive and communicated with me every step of the way. Rob explained everything in detail and proved he definitely is the best! Will be using his services again." "My husband and I are very happy with the job done by Rob--we will definitely use him in the future." "Rob did a great job mounting my TV and installing my fireplace mantel. I will definitely use Trebor Technical Solutions again." "Install was quick, efficient, and well done. TV looks great on the wall!" "We had our flat screen tv mounted on the wall and all wires concealed. Exceptional service! It looks wonderful." Rob is simply the BEST! "Rob did an INCREDIBLE job with mounting multiple flat panel televisions and pieces of art work. He is unbelievably professional and polite. He is the ONLY installer that I trust for my personal audio video and wall art installation needs." "The work was done meticulously. Rob fished the walls for a cable run across a room and between floors and everything was cleaned up at the end." True professional in every way!! 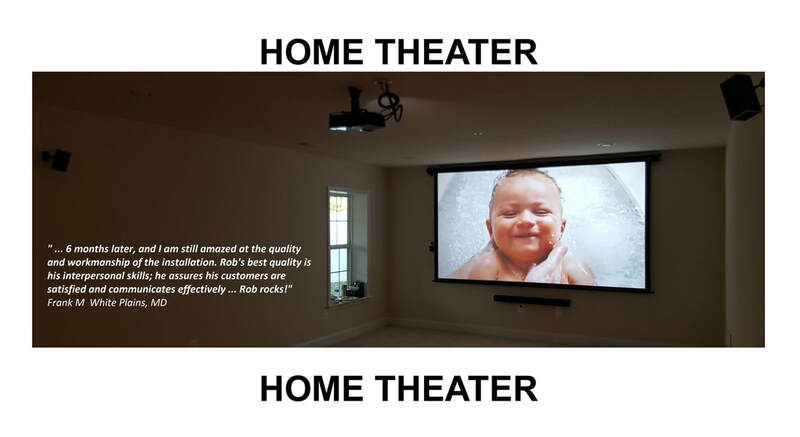 "Rob did a great job in setting up my home theater system. I am truly impressed with his knowledge of the systems, eye for detail, work ethics and professionalism. Will recommend him to everyone." "Rob was excellent. I had three tvs mounted in plaster walls. Also had the cable wiring rerouted in the house. Rob is very creative and always looking for ways to save cost. I will definitely us him again"
"Trebor Technical Solutions did an excellent job on installing a new cable drop for my parents. They arrived early, and were very courteous. The work was performed exceptionally well and the job, which I believed was going to be simple, ended up being more challenging than I originally thought. Even with the challenges, they did tan excellent job and were very pleasant. Based on my interaction, I would highly recommend this company!" "Rob had scheduled to be at our home at 4 o'clock on Sunday evening. After 4:30 had come and gone with no word, we gave a few calls to his phone, and we finally received a text back at 4:45 saying that he would need to reschedule. I'm sure he does fine work based off his other reviews, however having to cancel our afternoon plans and wait well after our appointed time with absolutely no word from Rob, we would've appreciated a notification of having to reschedule before or even at the time he was supposed to be here, not almost an hour after the scheduled time and after we had to give him a few calls in order to get a text back." "Had flat screen TV installed in existing wall bracket. Work was done meticulously. Everything cleaned up. No wires showing. Rep was late for appointment which caused a bit of a problem because of building restrictions on work hours. But job got done the same day it was ordered. Rep was quite personable." "Superb technical knowledge of AV stuff and great job planner. Really nice person and reasonable in the work budget." "My wife and I have been dealing with multiple contractors since our recent move, I must say Trebor Technical Solutions (TTS) has been our most pleasurable interaction. From the onset, the team was courteous and professional. The job was completed within the quoted time, at the quoted price, and to our extreme satisfaction. We will definitely be utilizing TTS for our future projects." "Rob did a great job and was very therow"
"Gerard was scheduled to come to provide an estimate, then ended up completing the work. He assessed the situation, identified a solution, and carried out the necessary work, adeptly dealing with the challenges related to a large, older structure. He also provided very helpful suggestions on some issues that were not included in the original service request. He was efficient, friendly and highly capable. I would definitely recommended his services." "Rob was amazing, by far exceeded my expectations. He was professional and kind, and even offered additional services helping me spackle something up. He is very smart and clearly knows what he is doing, and I would recommend him to all!" Derrick R. Beltsville MD TV Mounting "I hire GRC to mount my new 65' Sony UHD TV. I cannot rave more about how professional Rob was. They did a masterful job setting up the TV. I also had them put in a kit to hide the wires behind the walls and move my cable coaxial cable to another wall just below where the TV was being installed. The coaxial cable job was also masterful and they made the connection look neat and clean. Rob even consulted me on my system the most optimal way to get the sound and vision from my new install. This guy is amazing and even better are his prices. When I move my tv in the family room off its stand on onto the wall, I know who I will call to do the install." Andrew B. Baltimore MD TV Mounting "Rob came and wall mounted a flat screen in my apartment. He was very professional and it looks fantastic. Highly recommend!" 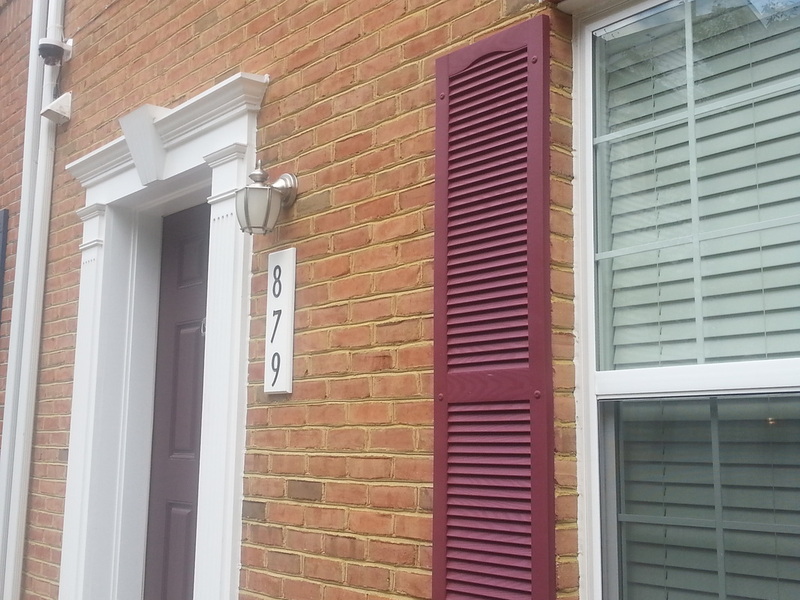 ﻿Nicole S. Arlington VA Network Cabling/Wiring/Wi-Fi Enhancement/TV Mounting "Rob is great. He did a wonderful job strengthening the Wi-Fi as well as hard wiring the internet throughout our whole home including sending wire from upstairs down into our basement and working with our 1950s home. Then I had him come back again to mount our brand new TV and he did a fabulous job and he is also wonderful with children he was super with my three month old and then later on when he was 10 months as well." 5. Mr. Cassagnol, Owner/Project Manager was very easy to work with. The installation of Internet and cable service was a breeze for the cable guy. Everthing works to meet my current needs and my house is cabled to meet anticipated future needs. I am more than pleased. Will use him in the future. I've already started recommending company to friends and family. Davar A. - Cafe Romeos - Washington DC Need Telephone System Services "I am the owner of Cafe Romeos in Georgetown' Gerard/Rob is by far the best technician that I have ever met in 20 years of dealing with different technicians . His honesty & integrity may be found in 1 person out of 1000's. Without charging me a penny he spend more than an hour educating me about the phone system of my store , I was ready to spend $ 500.00 to get new wiring . He told me about that option too .Yet advised me of better solutions . Chang L. Baltimore MD Home Security/Video Surveillance "I bought five camera and a DVR from Costco and got several quotes from different contractors for the installation, though Rob wasn't the cheapest one, he is very professional and show up on time for the free onsite quote to begin with and win my vote. His installation was perfect, after two weeks of using it, everything is running flawlessly!!! I can access my video camera anywhere w/ internet connection and keep my family safe. Rob is very careful, knowledgeable, full of experience, and with a lot patient to make sure everything is done correctly. He will explain the procedure and the whole process to his customer to make sure what is going on and to avoid any confusion. My wife and I is about to start a small business in Baltimore, and are thinking to install some camera system as well. 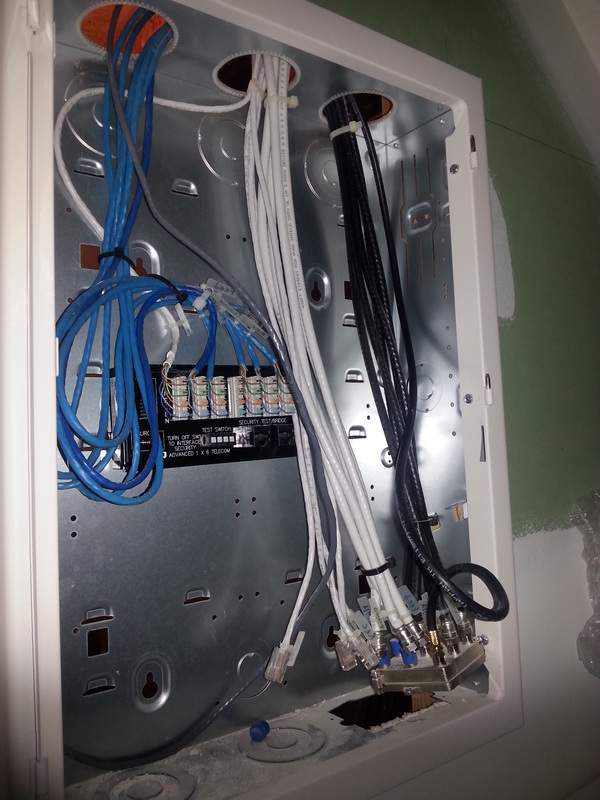 Ieva V. Washington DC Network Cabling/Wiring "I needed some cable and telephone wiring moved because it was hanging low in an area of my basement that i wanted to use. Gerard (Rob) did a great job - he advised on how to get the cable company to do what needed to be done with the cable wiring and did a great job moving and rerunning the phone wires. I definitely recommend him and will use him for future projects (such as home theater/FIOS). He is very knowledgeable and very pleasant to deal with."